EM24 Alert offers the world’s smallest two-way voice speakerphone pendant with a built-in microphone and speaker that operates just like a telephone. You can even receive telephone calls through the pendant so you’ll never have to rush for the phone again. EM24 Alert’s two-way voice speakerphone features a coverage area that is much greater than other technologies that communicate only through a base station. You will not have to scream to be heard by the operator and their voice will be clearly audible – because you have the pendant with you. For increased peace of mind, you can easily test the range of the system so that you have a clear idea of the protection area around your home. EM24 Alert offers an Emergency Wall Communicator that is perfect for mounting on a bathroom wall. This wireless, battery-operated unit provides the same two-way voice function as the pendant. 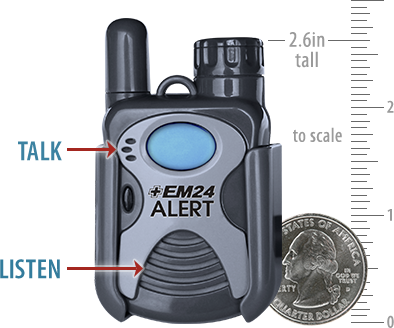 The reason to add an Emergency Wall Communicator to your system is that while the EM24 Alert pendant is rated as “water resistant,” which means it can function properly if it becomes wet as a result of spraying such as in the shower, it should not be submerged or continually exposed to water. Simple set up with only electrical and phone cords to plug in! Even during a power outage, you have protection. The EM24 Alert pendant requires only one Lithium Ion battery for four months of service or a full hour of emergency use. A second provided battery remains in the charging station of the Base unit when not being used. The Base unit ships with four rechargeable 2400 mAH NiMH batteries that will provide you with up to 24 hours of battery backup protection. Our two-way voice Speakerphone Pendant is always with you. This feature minimizes the dispatching of emergency responders to your home should an accidental activation occur.